New to Stardew Valley and want to make money fast? Experimenting with the new farm maps can help you get that fishing rod you had your eye on. At launch, Stardew Valley only had one map for every farm, and it was, you know, fine. It had a little pond, a bunch of trees and rocks, and lots of room for crops. With the 1.1 update there are now five maps to choose from, with each new map focusing on a different skillset. For my new save on the PS4 version, which comes out today, I opted for the fishing map, Riverland Farms, for no other reason than I found it the most aesthetically pleasing. 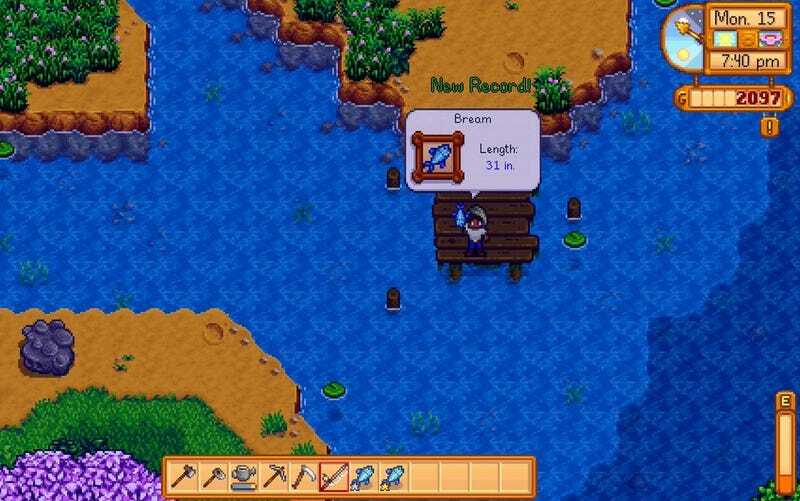 I hadn’t done much fishing on my previous save—in fact, I had kind of hated it—but my proximity to the water made leveling up the skill a no-brainer. By the 15th of Spring I’d reach level 5 in fishing, which had taken me several in-game years to reach when I’d last played. In the early game, before you have a kitchen, there’s not much to do with the fish besides sell them. On bountiful days, I can make a little over 2,000 gold through both fishing and farming. Between harvests, I can still make around a thousand, which is a substantial amount of money for the early game. I was able to buy a Chicken Coop before Spring ended, which means I can totally get mayonnaise going before Winter. Okay, staring at this screen for hours isn’t the funnest, but at least I’m rich. Stardew Valley releases today on Playstation 4 and tomorrow on Xbox One, so newer players that just want to get started raising animals or upgrading their equipment should try with the different maps introduced in the 1.1 update. You’ll be slinging that Iridium Fishing Rod before you know it.